Howlin says his party would "actively support" such politicians. LABOUR LEADER BRENDAN Howlin has said that his party would “actively support” SDLP politicians in Northern Ireland if they did not feel comfortable with moves towards a potential alliance with Fianna Fáil. The statement comes following a report in today’s Irish Times which stated that Fianna Fáil and the SDLP are to embark on a series of announcements early in the new year as part of a “phased integration” of the parties. 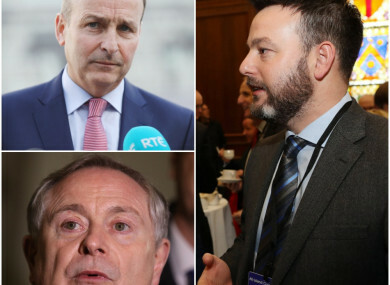 The report quoted a Fianna Fáil source which said the integration would ultimately lead to “one all-island party which will be called Fianna Fáil”. In response to the report, Howlin said this afternoon that he is mindful that some in the SDLP would not be in favour of a merger with Fianna Fáil and may feel closer to his party. “It is a matter for the membership of the SDLP to chart their future direction. But I am conscious that many in the SDLP feel closer to the Labour tradition than to the conservative nationalism of Fianna Fáil,” Howlin said. At our own conference in November, I said that the Labour Party would step in if the SDLP allies with Fianna Fáil. What that means is that we will actively support our comrades in Northern Ireland to continue to put a social democratic option to the people at elections. “People in Northern Ireland must be empowered to lead on how to pursue Labour politics, not dictated to by any party from south of the border,” Howlin added. The Labour leader also noted that former SDLP leader and MEP John Hume had built up historical links with the Party of European Socialists, the grouping of which both Labour and the SDLP are members. The potential alliance between the SDLP and Fianna Fáil has also prompted some objections from members of the Northern Irish party. The party’s youth wing SDLP Youth today reaffirmed its objection to the move. “We would like to reaffirm our position as carried at our Policy Conference in August 2018: SDLP Youth is against any merger, working arrangement, etc with any party whose values and principles are contradictory to the values and principles of the SDLP,” the group tweeted this afternoon. Current SDLP councillor and former Labour Senator Mairia Cahill also tweeted this afternoon that she would not be in favour of such a move. Moves towards Fianna Fáil contesting elections in Northern Ireland have been discussed for some time but last month Eamon O’Cúiv TD and Senator Mark Daly brought the issue to the fore once more. The party representatives made an unsanctioned move north in announcing that Sorcha McAnespy would contest Northern Ireland’s local elections as a Fianna Fáil candidate. Both men were slapped down by the party’s leadership but Ó Cuív told TheJournal.ie last week that he did not regret his actions. “I don’t know what the holdup is. It was promised for 2019 for the local elections – we keep getting told it is going to happen. I hope it happens and if I gave it a little push to try and force the issue and if I lost my place on the front bench as a consequence, I am happy to take the punishment,” he said. Email “Brendan Howlin says Labour would provide a home for SDLP members unhappy with FF merger”. Feedback on “Brendan Howlin says Labour would provide a home for SDLP members unhappy with FF merger”.